Нанесенные полиоксидные катализаторы на основе Мо и W испытаны в процессе окислительной конверсии пропана и пропан-бутановой смеси. Определено влияние температуры реакции, времени контакта, состава и содержания активного компонента катализатора. Mo және W негізіндегі тасмалданған поиоксидті катализаторлар пропа және пропан-бутан қоспасының тотықтыру конверсиясы процестерінде зерттелді. Катализатордағы белсенді компоненттің мөлшері және құрамы, жанасу уақты, реакция температурасның әсері анықталды. Supported polyoxide catalysts on the base of Mo and W, as well as natural Kazakhstan’s clays were tested in the process of oxidative conversion of propane and propane-butane mixture. 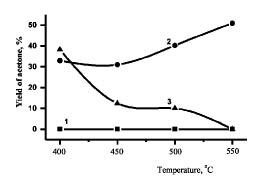 The influence of reaction temperature, contact time, composition and percentage of the active component of catalyst were determined. The important petrochemical products - acetone (500-550оС) and acetaldehyde (300-350оС) were the main liquid products of reaction on natural Kazakhstan’s clays and also on clays modified by Mo, Bi, Cr, Ga ions. Partial oxidation of liquefied oil gas into ketones and aldehydes is important both in ecology and economy because 10 billion m3 of casing-head gas is burned every year in the world and harmful exhaust into atmosphere measured by thousands of tons. Combustion process by means of huge consumption of oxygen and heat emission promotes strengthening of hotbed effect. The cost of 1000 m3 of oil gas is about $30. Thus economy lost the great sum heating sky. More expensive product than raw substances is possible obtain from oil gas [1,2]. The rapid development of the petrochemical industry in the last decade has raised acute problems of the optimal choice of feedstock and catalysts for relevant processes. According to forecasts for the near future, saturated C1-C4 hydrocarbons not only will retain but also will strengthen their position as a raw material for the production of unsaturated hydrocarbons. Therefore, the problem of searching for ways of their effective conversion into different oxygen-containing compounds is also urgent. Unlike methane and ethane, which yield less complex compounds, propane and butane are expected to give unsaturated hydrocarbons, aldehydes, acids, and alcohols. Only the optimal choice of catalysts can ensure targeted synthesis with the predominant formation of a desired compound selected from these products. Heterogeneous catalysts that are examined in the propane and butane oxidation reactions are represented by both individual [3,4] and mixed oxides [5,6], as well as by catalysts supported on different carriers, including zeolites [7-9]. The experiments were carried out at atmospheric pressure, 300-600oC, W=300-15000 h-1 in a continuous-flow unit with a fixed-bed quartz-tube reactor. The gas mixture used for oxidation contained propane and oxygen in a 1:2 ratio, as well as C3H8-C4H10 mixture (14-80%) and oxygen (4-18%) in different ratios. As catalysts, we used a) 1-10% Mo, Cr, Ga polyoxide catalysts with different composition and ratio supported on Torgai natural white clays (NWC) with kaolin structure and with admixture of hematite and α-quartz were dried at 120oC for 5 h and calcined at 300oC in air [10,11], b) heteropoly compounds (HPC) of Mo and W with the Si and P central atoms deposited on supports by the incipient wetness technique followed by calcination at 120oC for 5h in air. The heteropoly compounds were synthesized according to procedures described in [12,13]. An Agilent 6890N gas chromatograph equipped with an FID and TCD was employed for the on-line analysis of the products. The catalysts were characterized by transmission electron microscope (TEM), X-ray diffraction (XRD) analysis, and their surface area, porosity, and elemental composition were determined. Phase structure of catalysts was recorded on DRON-4-7, operating at 25kV and 25 mA and employing Co-Kα radiation, covering 2ө between 5 and 80o. Morphology, particles size, chemical composition of initial and worked out catalysts for 56 hours were performed on TEM-125K with enlargement up to 133000 times by replica method with extraction and micro diffraction. Carbonic replicas were sputtered in vacuum universal station, and carrier of catalysts was dissolved in HF. Identification of micro diffraction patterns were carried out by means of ASTM cart index (1986). It was shown that conversion of propane-butane mixture proceeds with the formation of gaseous and liquid products. Partial oxidation of propane-butane mixture with varying the catalytic mixture composition and the contact time yielded acetone, methyl ethyl ketone, methanol, acetaldehyde, croton aldehyde, butanol, and acetic acid, as well as C2-C3 unsaturated hydrocarbons. The results of propane oxidation on granulated catalysts made of PVW-HPC derivatives showed that the homogeneous oxidation of propane practically did not occur. The propane conversion (C) on the pure support is higher, and the use of catalysts sharply increases the conversion over the entire range of temperature. The main products are oxygen-containing compounds (mainly acetaldehyde), propylene, ethylene, and CO. The addition of water vapour decreases the propane conversion but increases the yield of olefins and oxygenated compounds over practically the whole range of temperatures (Table 1). Table 1. Oxidation of propane over 10%Na3PV7W5O40/aluminosilicate. С3Н8 – 5%, О2 – 10%, N2±Н2О = 85%. The increase in the contact time by a factor of 2,5 reveals that the selectivity and their yield become somewhat lower with an increase in temperature, but the yield of CO increases. This is explained by the fact that the products of incomplete oxidative dehydrogenation and oxidation are further oxidized to CO and CO2 at a longer contact time. The promotion of the catalysts with alkali or alkaline-earth metal salts increases the yield of ethylene. The admixture of water vapour significantly increases the rate of the process. For the oxidative conversion process, we also developed polyoxide low-metal-loading catalysts on the basis of molybdenum and tungsten HPC on monolithic (cordierite) supports. Cordierite, SiO2, zeocar, Al2O3, and aluminosilicate were used as the second supports. Zirconium and SiO2 were introduced as stabilizing additives in order to decrease the volatility and to stabilize the structure. The technology of deposition of polyoxide compounds on a porous block by varying the secondary support, the binder, and the protecting layer was developed. 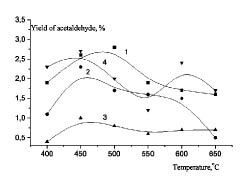 Figure 1 presents data on the yield of acetaldehyde plotted against the temperature of the reaction over monolithic catalyst specimens. Figure 1. Dependence of the acetaldehyde yield on the reaction temperature in the oxidation of a propane-butane mixture on different monolithic catalyst specimens (1) 5,5% Mg2SiMo12O40/cordierite/cordierite, (2) 5,0% Mg2SiMo12O40/cordierite/cordierite with the secondary support stabilized with Zr, (3) 4,9% Mg2SiMo12O40/cordierite/cordierite, with a Zr protective layer, and (40 5,0% Mg2SiMo12O40/cordierite/cordierite with a SiO2 protective layer. The Mg salt of SiMo heteropoly acid deposited on the cordierite block with a cordierite secondary support turned out to be the most active. It was found that supported Ni-containing HPC were optimal for the synthesis of hydrogen-rich hydrocarbon mixture. The yield of H2 in the oxidation of a propane-butane mixture was 60-64%. It was found that there were two temperature ranges for the formation of hydrogen and C2 hydrocarbons, which are determined by the occurrence of the oxidative-dimerization and cracking processes. The optimum contact time for the synthesis of H2 and C2H4 is 0,45-0,9s; T=800-900oC at the ratio of C3H8-C4H10:O2=20:1 and the minimum content of water vapour in the mixture. The tests on Torgai natural white clay (the base phase is kaolin Al2[OH]4Si2O5 (ASTM-29-1488) and α-quartz (SiO2)), as well as Torgai natural red clay, which differs from the white clay by the presence of hematite (Fe2O3) and the absence of α-quartz (less than 1%) showed that investigation in this direction is interesting also. The treatment of clay specimens with hydrochloric acid slightly changed their phase composition. The specific surface area and porosity of the sorbent specimens examined were determined by the Brunauer-Emmett-Teller low-temperature nitrogen adsorption technique. It was found that the clay surface area is 10-16 m2/g and that the optimum pore radius ranges from 20-50 Å. The treatment of sorbents with 10% HCl facilitated the development of pores and an increase in the pore radius. The elemental analysis of the initial sorbent specimens and those treated with 10% HCl showed that the clay specimens predominantly contained oxide compounds of Si and Al, as well as Ca, Mg, Fe, and Na. Up to 20 other elements in amounts from 0,0008 to 0,4% were found as concomitants. The SiO2/Al2O3 ratio (silica modulus) was 5-0,4. The silica modulus increases after acid treatment. The multi-peaked character of change in the catalytic properties during the oxidation of propane-butane mixture and the highest activity of low-loading supported catalysts are due to the existence of both crystalline and amorphous phases of heteropoly acids on the supports and to the appearance of strong interaction in the heteropoly acid-support system . Combination of TPR and IRS data indicate on formation of a new type of structure, caused by interaction of HPA fragments with carrier (for example, Si-O-Mo) together with amorphous structure of HPA in low-percentage supported catalysts. This interaction results in change of binding strength of catalytic oxygen and their reactivity concerning H2 and CH4. Important petrochemicals, such as acetone (500-550oC) and acetaldehyde (300-350oC) are main liquid products. Ethylene is the main product of gas phase. Yield of ethylene increases beginning from 450oC. 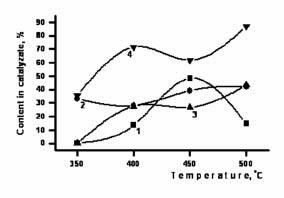 The investigation on influence of the nature of carrier on yield of acetone from reaction temperature was carried out. It was shown that more high yields of acetone were produced over NWC. Мо, Cr and Ga samples have shown more optimal properties during investigation of the series of monometallic (Mo, Ce, Bi, Cr, Ga, Fe, Mn, Ni, Co and Zn) supported over NWC catalysts. Ternary catalyst is more active than two-component samples. Investigation of 1, 5 and 10% MoCrGa/NC has shown that 5% sample is active in forming of ketones (acetone, methyl ethyl ketone), 10% - acetaldehyde and 1% - ethylene. The yield of acetone was increased from 32% at 400oC to 50,9% at 550oC, W=450h-1, C3-C4:O2:N2:Ar=5:1:4:5 over 5%MoCrGa/NWC (Figure 2). Optimal space velocities for catalysts with different content of active phase over carriers were determined. Up to 23% of acetone and 35% of methyl ethyl ketone on 1%MoCrGa/NWC were produced at W=1350h-1. Increase of content of acetone up to 31% in catalyzate was observed at reduction of propane-butane in reaction mixture. Dependence the yield of acetone from temperature at the different space velocity over 5% MoCrGa/NWC has shown on Figure 3. It was shown that more high yields of acetone were obtained at W=300-450h-1 at 350-550oC. The determination of the product composition showed that the process follows a complex mechanism including oxidation, oxidative dehydrogenation, and cracking. Figure 2. Dependence of the acetone yield on the reaction temperature in the oxidation of a propane-butane mixture. С3-С4:О2:N2:Ar=5:1:4:5; τ=8s; W=450h-1. 1- 1%MoCrGa/NWC; 2 - 5%MoCrGa/NWC; 3 - 10%MoCrGa/NWC. Modification of carrier by zeolite ZSM-5 in the presence of aluminium oxinitrate promoted increase the content of acetone in catalyzate up to 70-80%, but decreased the content of acetaldehyde, Figure 4. 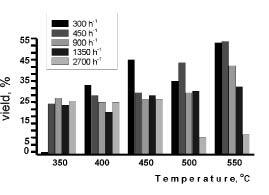 The content of acetone was higher the whole temperature interval. C3-C4:O2 ratio was varied in wide interval. C3-C4:O2=33,3:7,0 ratio is more optimal for selective obtaining of acetone and acetaldehyde. Figure 3. Dependence the yield of acetone from temperature at the different space velocity over 5%MoCrGa/NWC. C3-C4:O2:N2:Ar=33,3:7,0:26,4:33,3. Figure 4. Influence of the temperature on content of acetone in catalyzate at oxidation of propane-butane mixture. С3-С4:О2:N2:Ar=33.33%:7,0%:26,0%:33,67%. W=1350h-1. 1 - 1%MoCrGa/NWC; 2 - 5%MoCrGa/NWC; 3 - 10% MoCrGa/NW; 4 - 5%MoCrGa/NWC+ZSM-5 + Aln(OH)3n-1NO3. Large particles and aggregates from large dense particles are characteristic for initial MoCrGa/NWC catalyst. Micro-diffraction picture of particles is submitted by the separate rare reflexes referred to Cr2O3 (JCPDS, 6-508), CrO (JCPDS, 6-532), and also translucent lamellar type a particle, micro-diffraction picture from which is submitted by the reflexes which are settling down on hexagonal motive, referred to CrMoO4 (JCPDS, 34-474). For the Мо-containing phase processed in reaction conditions the dense large crystals (500-1000 Å) with attributes of rectangular motive the facets corresponding Mo4O11 (JCPDS, 13-142) are characteristic. For a Cr-containing phase the large translucent lamellar particles of α-Cr2O3 (JCPDS, 6-503), small congestions made from disperse particles in the size ~ 30Å, referred to Cr2O5 (JCPDS, 36-1329), aggregates from translucent particles with the minimal sizes 200-400 Å and more, characteristic for CrO2 (JCPDS, 9-332), congestion of translucent lamellar particles of Cr5O12 (JCPDS, 18-390) in the size 300-600 Ǻ with rectangular motive of a facet are characteristic. Besides small congestions, characteristic for the joint phases consisting of particles in the size 30-50 Ǻ and large lamellar particles are found. Micro-diffraction is submitted by a mix of rings and separate reflexes. Rings correspond to a phase of disperse particles of CrMoO4 (JCPDS, 29-452), and large lamellar crystals correspond to Cr2MoO6 (JCPDS, 33-401). For a Ga-containing phase the various phases for oxidation of Ga down to a metal phase are characteristic: α-Ga2O3 (JCPDS, 6-503), φ-Ga2O3 (JCPDS, 20-426), ε-Ga2O3 (JCPDS, 6-509) in a mix with Ga (JCPDS, 31-539), Ga (JCPDS, 25-345). Comparison with EМ pictures of initial samples of catalysts has allowed to determine, that as a result of their processing in reaction conditions there is the new phase Cr2O5 corresponding to transition Cr2 + and Cr3 + into Cr5 +, and also joint phases of Мо with Cr in various valent conditions. The physical sense and role of them should be determined. 1%MoCrGa/NWC catalyst at 550oC and W=750h-1 in reaction mixture С3-С4:О2:N2=7:1:4. This screening study aimed at searching for appropriate compositions and technological parameters of the oxidative conversion of propane and the propane-butane mixture show that the chosen line of research is promising and makes it possible to obtain good results in the synthesis of hydrocarbons and oxygenated compounds. 1. Udalova O.V., Shashkin D.P., Shibanova M.D. and Krylov O.V., Catalysis in Industry 6 (2007) 3. 2. Massalimova B.K., Tungatarova C.A., Dossumov K. and Kuzembai K.K., Chemical Journal of Kazakhstan 4 (2006) 133. 3. Danilova I.G., Paukshtis E.A., Kalinkin A.V., et al., Kinet. Katal. 43 (2002) 747. 4. Chen Ming-shu, Weng Wei-Zheng and Wan Hui-Lin, J. Mol. Catal. 14 (2000) 6. 5. Harrison P.G., Bailey C. and Azelee W., J. Catal. 186 (1999) 147. 6. Feng Ling-Yun, Qiu Jin-Heng, Lin Ming, and Xu Bo-Lian Chen Yi, Huaxue xuebao 60 (2002) 1006. 7. Erofeev V.I., Trofimova A.S., Koval’ L.M. and Ryabov Yu.V., Zh. Prikl. Khim. (St. Petersburg) 73 (2000) 1969. 8. Khodakov A., Olthof B., Bell A.T. and Iglesia E., J. Catal. 181 (1999) 205. 9. Choudhary V.R., Mantri K. and Sivadinarayana C., Micropor. Mesopor. Mater. : Zeolites, Clays, Carbons, Relat. Mater. 37 (2000) 1. 10. Dossumov K., Tungatarova S.A., Kuzembaev K.K. and Massalimova B.K., Petroleum Chemistry 45 (2005) 261. 11. Dossumov K., Tungatarova S.A., Kuzembaev K.K. and Massalimova B.K., Izv. NAN RK, Ser. Khim. 5 (2004) 70. 12. Pope M.T., Heteropoly and Isopoly Oxometalates (Springer, Berlin, 1983; Nauka, Novosibirsk, 1990). 13. Handbuch der praporativen anorganischen Chemie, Ed. By G. Brauer (Ferdinand Enke, Stuttgart, 1981; Mir, Moscow, 1985). 14. Tungatarova S.A., Savelieva G.A. and Dossumov K., in: Proceedings of NATO Advanced Study Institute. Sustainable Strategies for the Upgrading of Natural Gas: Fundamentals, Challenges, and Opportunities, Vilamoura, Algarve, Portugal, 2003, 345.